Jambavan/Jamvanta is a character originating in Indian epic poetry. The King of the Bears, he is an Asiatic or sloth bear in Indian epic tradition (though he is also described as a monkey in other scriptures), immortal to all but his father Brahma. Several times he is mentioned as Kapishreshtha (Foremost among the monkeys) and other epithets generally given to the Vanaras. He is known as Riksharaj (King of the Rikshas). Rikshas are described as something like Vanaras but in later versions of Ramayana Rikshas are described as bears. He was created by Brahma, to assist Rama in his struggle against Ravana. Jambavan was present at the churning of the ocean, and is supposed to have circled Vamana seven times when he was acquiring the three worlds from Mahabali. The major bloodline of Jambavan is to be found in Karnataka named shri Bramhananda muni swamiji chitrarudga, Hiriyur, Karnataka. Jambavan is also known as Jamvanta, Jambavantha, Jambavat, Jambuvan, Jambuwana (Malay), Zabaman (Burmese), Keeratuvan (Punjabi) Sambuvan (Tamil), and Chomphuphan (Thai). Jambavan in his previous life was the King of the Himalayas who had incarnated as a bear in order to serve Lord Rama. He received a boon from Lord Rama that he would have a long life, and have the strength of ten million lions. In the epic Ramayana, Jambavantha helped Rama find his wife Sita and fight her abductor, Ravana. It is he who makes Hanuman realize his immense capabilities and encourages him to fly across the ocean to search for Sita in Lanka. In the Mahabharata, Jambavantha had killed a lion, who had acquired a gem called Syamantaka from Prasena after killing him. Krishna was suspected of killing Prasena for the jewel, so he tracked Prasena's steps until he learned that he had been killed by a lion who had been killed by a bear. Krishna tracked Jambavantha to his cave and a fight ensued. After eighteen days, realizing who Krishna was, Jambavantha submitted. 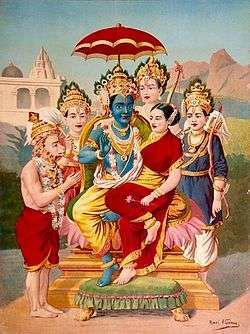 He gave Krishna the gem and also presented him his daughter Jambavati, who became one of Krishna's wives. Jambavan mentions two past incidents in his life in the Ramayana. Once at the foot of Mount Mahendra, where Hanuman is about to take a leap and mentions that he could have jumped over the ocean to Lanka except that he got injured when he was beating the drum for Vishnu during the Vamana Avatara when the Supreme God measured the three worlds. Vamana's shoulder struck Jambavan and he was injured which limited his mobility. And once during the Samudra-Manthan,he was present at the time of the event. He got to know about the all-curing plant Vishalyakarni from the gods there and he later used this information to convey Hanuman to help an injured Laxmana who was rendered unconscious by Indrajit. Jambavan, together with Parasuram and Hanuman, is considered to be one of the few to have been present for both Ram and Krishna avatars. Said to have been present for the churning of the ocean and thus witness to the Kurma avatar, and further the Vaman avatar, Jambavan may well be the longest lived of the chiranjivis and have been witness to nine avatars. Jamthun (जामथुन) - Jamthun village in Ratlam tahsil in Ratlam district in Madhya Pradesh, located in northwest of Ratlam city, has traces of ancient habitation. It is known as the city of Jamvanta (जाम्‍वन्त) or Jamvanta Nagari. Ancient bricks have been found in excavations. ↑ "Jambavan: The only one who saw Lord Rama and Krishna". Jambavantha motivating Hanuman for the task of leaping the ocean. in Valmiki Ramayana - Kishkindha Kanda in Prose Sarga 65 - Accessed August 14, 2006.